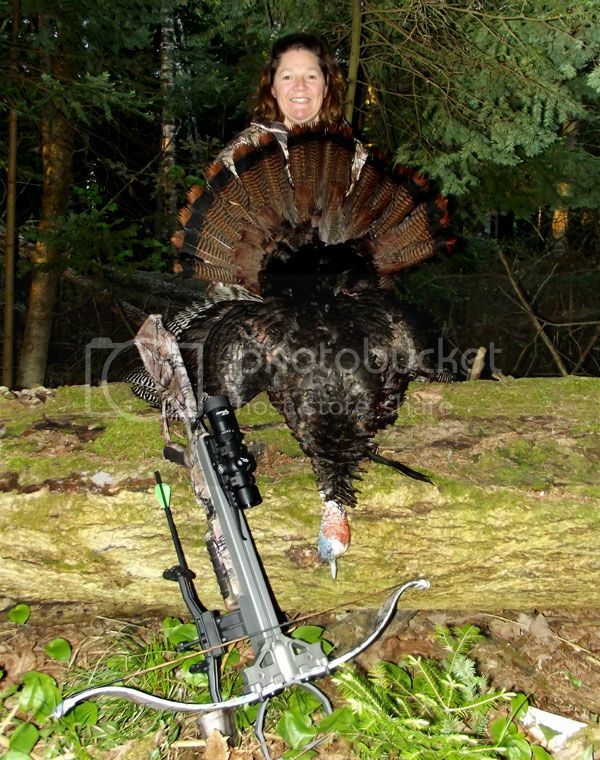 One day while telling lies in Bennetts BaitnTackle, Steve Moss of Mossy’s Smoke Shop asked me if Birdee hunted Turkey. That’s where this journey for her started. Turkeys were always on Birdees hit list when it came to hunting. The hassle of spending a day in a classroom and the cost of that course always held her back. When informed that she could simply get a DVD and review it at home and challenge the test it was game on. A week later she passed the test with a 100% mark. 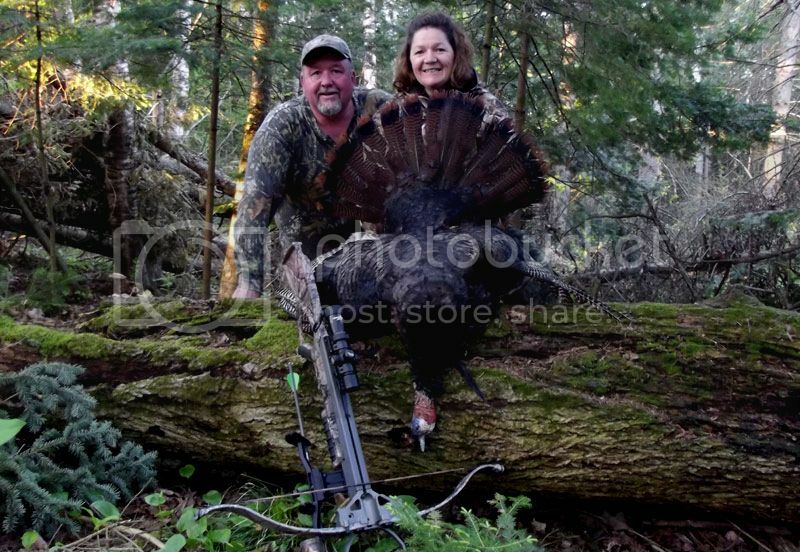 This year Birdee is using the new Excalibur Matrix 355 Crossbow. She loves it. A tougher draw for her but smaller in size and deadly. Steve had birds patterned so it was just a matter of finding time when they could get together to get out in the field. The first day they went out just grew Birdees excitement of the hunt. Hens committed to the decoy but the Toms stayed back at 80 yards. After that day she couldn’t wait to get back out. Day two was a different story. Once in Steve’s laneway they just sat and listened to the birds. Steve knew they had a nice Tom not far off that was using an old laneway every day. Once they heard him in that direction they set off to get setup. Steve began calling and when they answered they were still roosted. He flapped his hat against his leg simulating birds coming off the roost. That did the trick and it wasn’t too long that they were on the ground. Two Jakes made the turn on the corner towards them as they were setup behind a large tree. Steve urged Birdee, “Take the one on the left, he’s bigger.” As they walked down the lane side by side she readied for her shot. “Wait!, Take the Tom behind them!”. He comes big boy behind them. Just as she was ready to send a bolt flying his way the Jakes stepped in front of him briefly, once the coast was clear Birdee took her shot. Turkey tag filled and one thrilled hunter. Stats on the bird were bang on 20 lbs, 7/8ths inch Spurs and a 10 inch beard. Huge thanks to Steve Moss for making this happen!